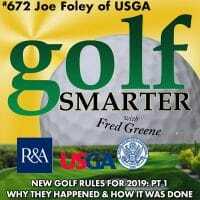 672: Golf Rules have changed for 2019 and our featured guest is Joe Foley of the USGA Rules Committee. In Part1 of these next 2 episodes, we discuss what the motivation was for implementing new rules and how they were agreed upon with members of both the USGA and the R&A. Host Fred Greene is always encouraging listeners to get in touch to play 18 holes together. Last week he played with a listener who was visiting Northern California from Germany. You’ll hear part of their conversation on the show, but if you’d like to see the video and photos from their round at The Meadow Club in Marin County, CA check it out at https://youtu.be/kE5HKoNHk-E. The audio from all new episodes of Golf Smarter are now available at YouTube.com/GolfSmarterTV.